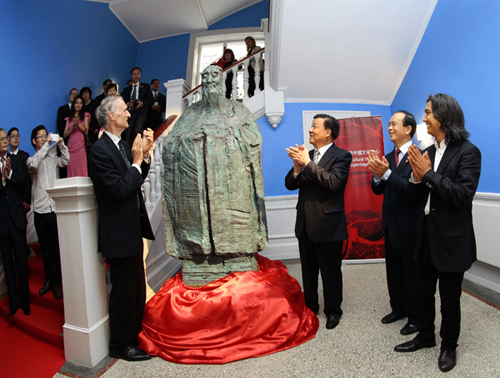 On June 14-16, 2012, Chinese President Hu Jintao was invited to pay a state visit to Denmark. Both sides signed documents, including agreements on the mutual establishment of cultural centers, cultural heritage protection and promotion of education and cooperation. At the invitation of Danish Culture Secretary Marianne Jelved, Yang Zhijin, Vice Minister of the Ministry of Culture, led a cultural delegation visiting Denmark in December 2013. Both sides signed the Agreements on Mutual Establishment of Cultural Centers between China and Denmark. Yang appreciated Danish efforts to promote the signing of the agreement and pointed out that the establishment of cultural centers will certainly provide a new platform for cultural exchanges and cooperation between China and Denmark. 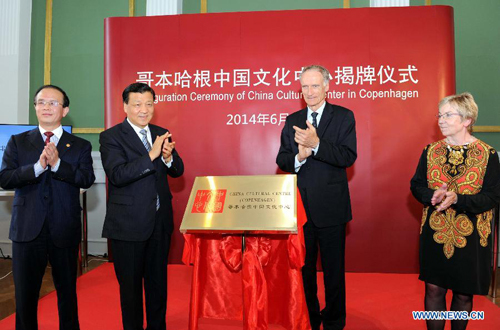 On June 11, 2014, Liu Yunshan, a member of the Standing Committee of the Political Bureau of the CPC Central Committee and member of the Secretariat of the Central Committee, came to the Chinese Cultural Center on Andersen Road in Copenhagen during an official visit to Denmark. There, he participated in cultural exchange activities between China and Denmark and launched the Chinese Culture Center in Denmark. Situated at Hans Christian Andersen Boulevard, right in the heart of Copenhagen, a newly-painted yellow building has been particularly attracting public attention. This is where the new Chinese Culture Center located, after its grand opening on June 11. The building which was designed by the architect Christian L. Thuren and erected in 1906, has until recently housed the Royal Danish Academy of Music. The cultural center, a non-profit institution, will be used as a library, for exhibitions, concerts and education. It has three main functions. First of all, it is an information center with a library that contains all kinds of information about China. If Danes want to get to know China without going abroad, the Chinese culture center will be the first choice. It also is served as a platform for cultural activities such as concerts, lectures, seminars and exhibitions. Last but not least, it is a training facility. Like many other culture centers have language classes, this center offers Chinese language education, calligraphy, Chinese painting, and so on.